A cabalistic commentator on the Bible; flourished in the seventeenth century. 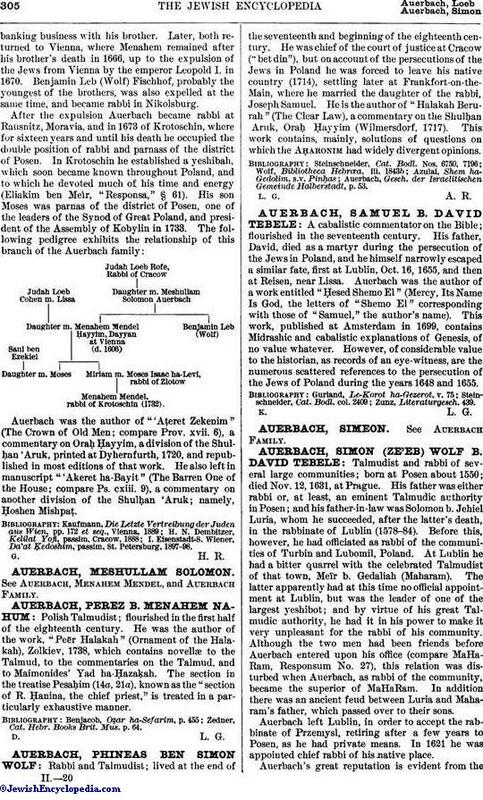 His father, David, died as a martyr during the persecution of the Jews in Poland, and he himself narrowly escaped a similar fate, first at Lublin, Oct. 16, 1655, and then at Reisen, near Lissa. Auerbach was the author of a work entitled "Ḥesed Shemo El" (Mercy, Its Name Is God, the letters of "Shemo El" corresponding with those of "Samuel," the author's name). This work, published at Amsterdam in 1699, contains Midrashic and cabalistic explanations of Genesis, of no value whatever. However, of considerable value to the historian, as records of an eye-witness, are the numerous scattered references to the persecution of the Jews of Poland during the years 1648 and 1655.